In Bushido players take on the roles of Daimyos, feudal lords in medieval Japan, and compete to become the next shogun of the empire, who gets appointed by the emperor. A game of resource management and conflict, the main goal is to earn enough honor, which can be achieved in different ways, either by holding provinces, winning battles, or through influential ceremonies. The first Daimyo who earns 50 points of honor wins the game. 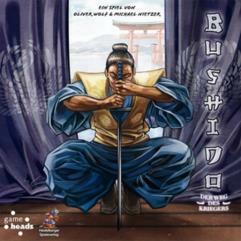 Bushido is a board game of clever mechanics and subtle strategy. Please note this is a German language import. It has German components but includes English rules.